Nothing beats a Christmas Woolworths mud cake hack for a quick and easy Christmas dessert. 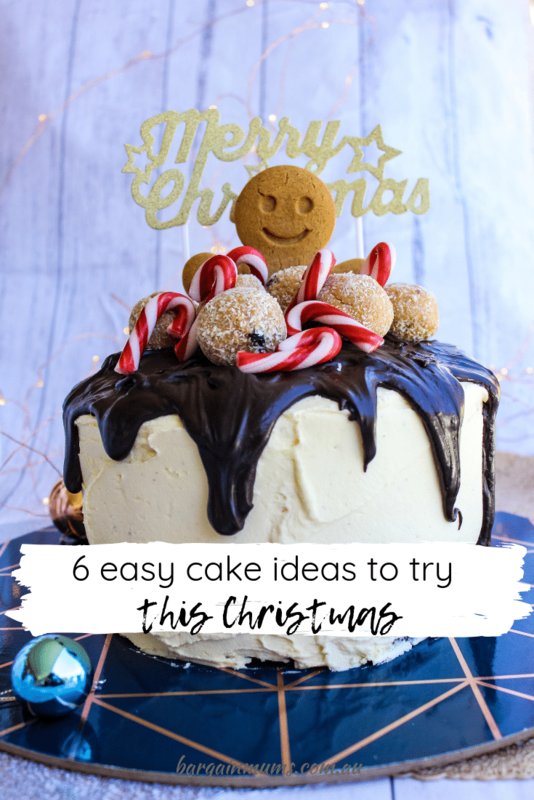 You have probably heard of Woolworths mud cakes making great birthday cakes, but they also make amazing Christmas cakes when decorated with a Christmas theme. Over the past few years every birthday cake I have made has been some type of Woolworths mud cake hack, including this unicorn mud cake hack I did for my daughters birthday. The mud cakes themselves are super budget friendly, and they taste pretty good too! All it takes is some buttercream icing and a few decorations and you have a cake that is sure to impress, yet took no time at all. I decided that mud cake hacks shouldn’t be left just for birthday parties, and have been experimenting with mud cake hacks for other events. I even did a spooky themed Halloween mud cake hack for Halloween this year. This delicious Christmas mud cake hack starts with two Woolworths mud cakes. You can use any flavour mud cake you like, but I find the dark and white chocolate cakes to be the easiest to work with. If you prefer to use the caramel, scrape off the caramel icing before stacking the cakes, otherwise the caramel icing tends to cause the top cakes to slide off. To stick the cakes together you will need buttercream icing or another similar icing in a big enough quantity to spread a small amount in between each layer as well as cover the outside of the cakes. Once the cakes are iced with the buttercream, use cooled dark chocolate ganache to top the cake, allowing it to drip down the sides. Once the dark chocolate ganache has set, it’s time to decorate the cake. 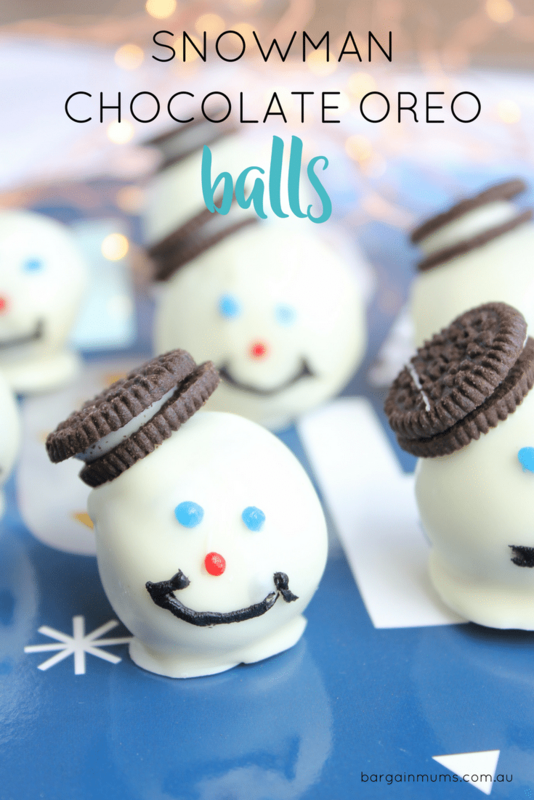 You can use any Christmas themes treats to decorate with, or do as I did and use white chocolate rum balls, mini candy canes and a gingerbread man. Start by making the buttercream icing. Add the softened butter to the bowl of a stand mixer and beat until light and fluffy. Add the vanilla extract, then gradually add the icing sugar while beating. Continue beating until the icing is pale and thick. Place one of the Woolworths mud cakes on a serving plate or cake board, and top with a little vanilla buttercream. Place the second cake on top, then cover the sides and top with the buttercream. To make the dark chocolate ganache, add the dark chocolate and thickened cream to a microwave safe bowl and microwave in short bursts, stirring in between until the chocolate has melted and ganache is well combined. Allow to cool to room temperature. Once the ganache has cooled (putting it on the cake while too warm will cause the buttercream underneath to melt, and the ganache will slide right off), pour the ganache over the top of the cake, encouraging sections to drip over the edge of the cake. 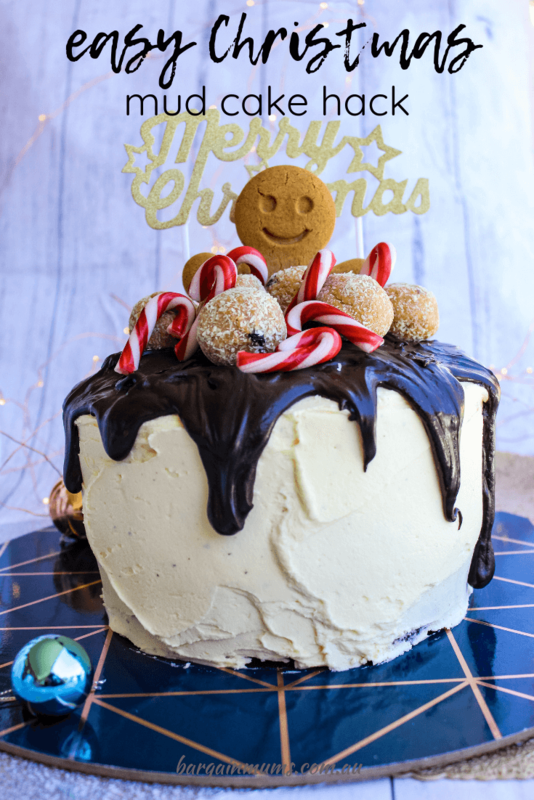 ﻿Top the cake with the gingerbread man, the mini candy canes and Woolworths White Rum Balls.